This dessert is seriously one of our favorites of all time! It’s always the one we make when entertaining, especially as the weather starts to shift and we’re looking for something to show off all the pretty fruit and produce that’s in season. You can customize this to whatever your favorite fruit is and dress it up with some chamomile or edible flowers to make it picture perfect! And bonus, it’s gluten free! For the meringue: Heat the oven to 350 degrees. Line baking sheet with parchment paper. Trace a 9" circle on the parchment paper and then flip over so the pencil is on the underside. Beat eggs whites and cream of tartar until frothy. Slowly add in sugar and beat until stiff peaks form and shiny. Make sure not to under beat. Mound onto parchment paper using the circle outline as your guide. I like to build it up a little on the edges so there's a bit of a slight dip in the middle. This will help the filling mixture stay on top and not slide off. Place in oven and immediately reduce the heat to 300 degrees. Bake for 1 hour and 15 minutes. Turn off the oven and let meringue cool completely before taking it out. For the filling: Whip cream until stiff. In a separate bowl beat the cream cheese, sugar and vanilla. Fold together the whipped cream and cream cheese mixture. 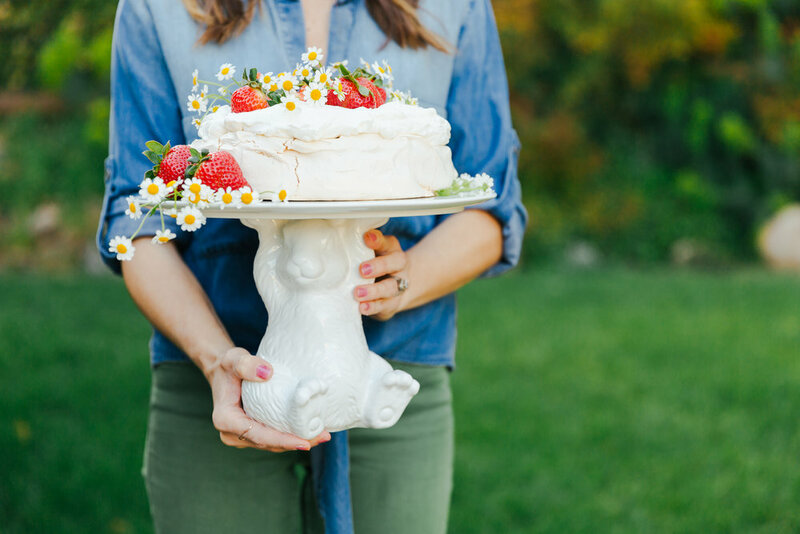 Assembly: When you're ready to serve, remove the meringue crust from the parchment paper and place on cake stand or serving platter. Top the pavlova with the filling, being careful not to crush the meringue as you spread it on. Cover the filling with fresh strawberries and serve. We used strawberries for this one, but you can use any combination of fruit. Some of our favorites are mangos, kiwi, blueberries and raspberries.